Alan Tait was a dual-code international who represented Scotland and Great Britain at centre in both League and Union. His father was a League player for Workington but Tait played Union first and made his Test debut for Scotland in the inaugural World Cup in 1987 in New Zealand when he came on as a replacement in a 20-20 draw with France in Christchurch. The following year he switched to League and stayed there for eight years playing club rugby for Widnes and Leeds as well as representing Britain and Scotland. Once Union turned professional he joined Newcastle Falcons. In 1997 he played for Scotland again after a nine year absence and went on to represent the British & Irish Lions in South Africa. Tait started the first two Tests on the wing, even though his favoured position was centre, and famously scored a try in the first match as the Lions won 25-16 in Cape Town. He also played in the second match which saw the Lions clinch the series after a dramatic 18-15 victory in Durban. In 1999 Tait played his final year of international rugby and won the Five Nations Championship as Scotland narrowly finished ahead of England on points difference thanks to Wales' last minute victory over England at Wembley. Tait scored two tries in Scotland's final match of the tournament as they put in an historic performance to beat France 36-22. Later that year he represented his country for the last time at the 1999 World Cup finishing with a defeat to the All Blacks. He scored a try against South Africa in the pool stages at Murrayfield in a 46-29 reverse to the holders. 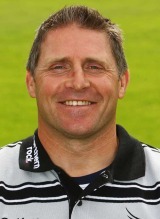 In 2000 Tait retired from professional rugby finishing his last game playing for his final club Edinburgh Reivers. He then moved into coaching, working with Scotland and the Newcastle Falcons as an assistant before assuming the top job at the Premiership club as part of a restructuring process in the wake of Steve Bate's departure from the post of director of rugby. But Newcastle have experienced hard times in the Premiership. They finished second bottom in the 2010-11 season - only staying up thanks to Northampton beating Leeds elsewhere - and in the 2011-12 season they find themselves at the foot of the table once again.